Recently I acquired a very interesting 6" hand made spoon which appeared to be a memento of a 100th celebration. This spoon has led me on a far reaching excursion into the development of modern medicine including the founding of Johns Hopkins medical school, the poetry of Walt Whitman, the cosmic consciousness of Dr. Bucke and the ancient religious mystical philosophies of the Buddha, Jesus and the Kabbalah as well as Canadian history. The journey was interesting and fascinating and ended up in quite a different place than I originally expected. Around the turn of the 20th century, it was fashionable to have "souvenir" spoons to commemorate certain events. Most of these spoons are wonderful silver memorabilia of customs or events which appealed to a wide variety of spoon collectors. Collectors of these mementos occasionally discover custom made spoons which were designed for specific individuals or to commemorate family events. This spoon had two engraved names, a date, a logo, and other letters and it took extensive research to figure it out. At the finial of the spoon is a stylized cross which is often referred to as as a 'ringed cross'. This type of cross has ancient roots in the Scottish, Irish and Welch community and appears to have been adopted into Christianity from its Celtic origins. "The knotwork, spirals and key patterns on the carved cross side of [the] 7th or 8th century Pictish monument are usually treated by scholars as a subject that can be described and classified but is rarely interpreted. When the meaning of the decorative elements are attempted the academic scholar tends to be very cautious and will often cite obscure references in ways that make their text difficult to understand." 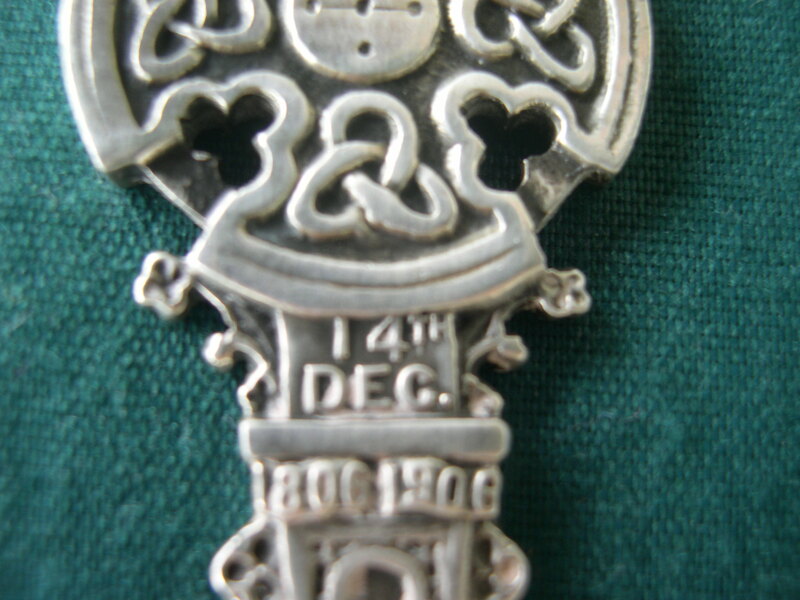 Below the ringed cross is the date "14th Dec." and below the day, the years "1806-1906". It was immediately obvious to me that this was a 100th year commemorative of something happening on Dec. 14. The front of the handle is decorated with various knots and patterns and the motto "one and all" is presented. The bowl is left unused on front and back. Around the top edge of the ringed cross, we find the words "Ellen Free Osler" deeply engraved in a plain modernist style (unable to get a picture). On the back of the ringed cross we find the words/letters "MeorRasdheDheu" engraved in an older english style script. On the back of the handle we find the name "Britton Vaughan Abbott" in an engraving style popular at that time in history. The mark is an anchor, the letter "E' in a maple leaf, and a rampant lion all of which are above the word "sterling". Rainwater's "Encyclopedia of American Silver Manufacturers" 3rd Edition identifies this mark as belonging to J.E.Ellis & Co. of Toronto, Canada. However this firm ceased operation in 1901 when the contents were auctioned off, but we know this spoon was created in 1906. There was a 'successor' firm , P.W. Ellis of Toronto, Canada which was incorporated in 1901 and I suspect that this spoon was made by the P.W. Ellis company and they used the 'old marks' for this commission. Extensive research finally led to "Ellen Free Osler", born to Rev. Featherstone Lake Osler and Ellen Free Pickton Osler on Dec. 14, 1806 in England. Thus my initial inclination that this was a spoon to commemorate a 100th anniversary was confirmed. I later received further confirmation that a major birthday celebration was held to commemorate her 100th birthday. At that time, a person living to 100 was a very rare event. Mrs. Osler had nine children. The eighth, "William" became one of the most famous doctors of all time. "John S. Billings recruited William Osler in 1888 to be physician-in-chief of the soon-to-open Johns Hopkins Hospital and professor of medicine at the planned school of medicine. Osler was the second appointed member of the original four medical faculty, following William H. Welch and preceding Howard A. Kelly and William S. Halsted. He revolutionized the medical curriculum of the United States and Canada, synthesizing the best of the English and German systems. Osler adapted the English system to egalitarian American principles by teaching all medical students at the bedside. He believed that students learned best by doing and clinical instruction should therefore begin with the patient and end with the patient. Books and lectures were supportive tools to this end. The same principles applied to the laboratory, and all students were expected to do some work in the bacteriology laboratory. Osler introduced the German postgraduate training system, instituting one year of general internship followed by several years of residency with increasing clinical responsibilities. William Osler’s book, The Principles and Practice of Medicine, first published in 1892, supported his imaginative new curriculum. It was based upon the advances in medical science of the previous fifty years and remained the standard text on clinical medicine for the next forty years. In 1905 he accepted the Regius Professorship of Medicine at Oxford University, at the time the most prestigious medical appointment in the English-speaking world. He left Maryland with warm feelings for Hopkins knowing that his sixteen years spent had laid a solid foundation for the future of Hopkins medical education." The Osler Library for the History of Medicine, based at McGill University, Montreal, claims to be "Canada's foremost scholarly resource in the history of medicine, and one of the most important libraries of its type in North America." The Library has at its core a collection of 8000 works relating to the history of medicine donated by William Osler. I contacted the curator of that museum, Chris Lyons, Assistant History of Medicine/Biomedical Ethics, Liaison Librarian, Osler Library of the History of Medicine, McGill University, and he answered some of my questions about the spoon: "Thank you for your question[s]. I have looked into the question of your spoon and discovered that there were commemorative spoons made to celebrate the 100th birthday of Ellen Free Osler on December 14, 1906. The birthday party was held in Toronto and her living children, including Sir William Osler, and her grandchildren and great grandchildren attended. Special plates and spoons were given to all the descendents "and have become treasured family memorabilia." This information comes from Michael Bliss' biography of Sir William Osler, "William Osler: A Life in Medicine" (Toronto: University of Toronto Press, 1999), P. 337. Harvey Cushing's biography "The Life Of Sir William Osler" (Oxford, 1925) says that Ellen Free Osler had the spoons made. They had a Cornish cross for a handle and came in three sizes for the 6 living children, 26 grandchildren and 21 great-grandchildren (volume 2, p. 72). Britton Vaughan Abbott was one of the descendents. She was the daughter of Georgina Pickton Osler and Alexander Crever Abbott. Britton was born on 15 January 1897. Georgina Pickton Osler was the daughter of Featherstone Osler, who was one of Ellen Free Osler's sons and a brother of William Osler, making Britton a great granddaughter. This information is from "The Descendants of Edward Osler(1734-1786) of Falmouth" which was compiled by Paul McFarland in London, England in 1993. I could not find anything on the significance of "one and all" and "MeorBasoheDheu". I hope this helps. Congratulations on obtaining such an interesting item." This information tells us that spoons were distributed to many of the descendents. Since this item is engraved "Britton Vaughn Abbott", I suspect that she was the recipient of this particular spoon. Britton's father was a famous dentist: "The study of bacteriology was instituted as a new course for third year dental students in 1896. Alexander Crever Abbott, M.D., Dr. P.H., Sc.D. (1860-1935), the Pepper Professor of Hygiene and Director of the Laboratory of Hygiene at the University of Pennsylvania, was hired as the course director. A. C. Abbott was one of the three founding fathers of the Society of American Bacteriologists (now the American Society for Microbiology) at a meeting held at Yale University Medical School (December 27-29, 1899). He was instrumental in creating the first graduate course in public health in the United States. Several of his seminal works were The Hygiene of Transmissible Diseases and The Principles of Bacteriology which became the text for the dental school course. This was the first textbook on bacteriology in the United States. In 1897 a laboratory for bacteriological work was included in the newly constructed Dental Hall." I was unable to find any information about Britton Vaughan Abbott's life or any further information on her mother. Ellen Free Osler also had three other children who became very important in Canada. Britton Bath Osler is recognized as one of Canada’s most distinguished trial lawyers. As a prosecutor he was involved in numerous murder trials including the conviction of Louis Riel, "the father of Manitoba", on charges of treason following the North-West Rebellion of 1885. Riel was viewed sympathetically in the French speaking regions of Canada, and his execution had a lasting influence on relations between the province of Quebec and the English speaking provinces of Canada. Riel remains one of the most complex, controversial, and ultimately tragic figures in the history of Canada. Featherstone Osler (Jr.) was called to the bar in 1860 and made a Judge of the Court of Common Pleas in 1879 and a Judge of the Court of Appeals in 1883. In 1880, he had refused an appointment to the Supreme Court of Canada because he didn't speak French. He retired from the bench in 1910 and became president of the Toronto General Trusts Corporation. Edmund Boyd Osler started his career as a clerk at the Bank of Upper Canada, where he stayed until 1867, when the bank failed, and then as an independent financier and stockbroker with different partners. He was involved with many railroad projects and became president of the Ontario and Quebéc Railway and later also director of the Canadian Pacific Railway. He was also director of the Toronto General Trusts Company and the Canada North-West Land Company, and president of the Dominion Bank. From 1896 until 1917, Edmund Osler was continuously re- elected to the House of Commons as a Conservative from West Toronto. A google search turned up the phrase "one and all" in one of Dr. Osler's many speeches. He said: "to you who hear me now, and to you who may elsewhere read my words, to you who do our greatest work labouring incessantly for small rewards in towns and country places, to you the more favoured ones who have special fields of work, to you teachers and professors and scientific workers, to one and all through the length and breadth of the land, I give you a single word as my parting commandment. It is not hidden from thee, neither is it far off. It is not in heaven that thou shouldst say, ‘Who shall go up for us to heaven and bring it unto us that we may hear it and do it?’ Neither is it beyond the sea that thou shouldst say, ‘Who shall go over the sea for us and bring it unto us, that we may hear it and do it?’ But the word is very nigh unto thee, in thy mouth and in thy heart, that thou mayest do it [Dr. Osler is quoting Deuteronomy] — charity." I have not been able to determine conclusively why the phrase "one and all" was used on a spoon commemorating Mrs. Osler's centennial birthday party, but assume that it was related to Sir William Osler's relationship with Walt Whitman, the famous poet. The phrase, "one and all" was also used by Walt Whitman in his most important work, "Leaves of Grass": "The city sleeps and the country sleeps, the living sleep for their time, the dead sleep for their time, the old husband sleeps by his wife and the young husband sleeps by his wife; and these tend inward to me, and I tend outward to them, and such as it is to be of these more or less I am, and of these one and all I weave the song of myself. " The biggest mystery on the spoon are the engraved words/letters "MeorRasdheDheu". Despite extensive investigation, I do not have a good definition of these words. The words are not English and I suspect that they are of indo-European origin and are probably related to Dr. Bucke's theory of Cosmic Consciousness. This part of the report is speculation as to the meaning of these words. Dr. Bucke's classic book, "Cosmic Consciousness: A Study in the Evolution of the Human Mind ", pub. 1901 (still in print) and is one of the leading books on mysticism. Briefly he contends "a third type of consciousness among humans. There is, first, the simple consciousness of existence and, second, a higher level of self-consciousness. Bucke added a third and profoundly higher level, 'cosmic consciousness', which he believed to have been attained by only a few dozen individuals by 1901. These include Jesus, Buddha, Mohammed, Dante, Whitman, Francis Bacon, Blake, as well as Bucke himself." As far as I was able to determine, "meor" comes from the old Kaballah mysticism of Judiasm and is related to an elevated or redeemed position in cosmic intelligence. I was not able to determine a meaning for "Rasdhe" under this or various related spellings. "Dheu" apparently has its roots from a spiritual death and is related to the final separation of the spirit/soul from the body which is a basic philosophy of most religions. All of this somehow relates to the Hindu cycle of rebirth [circle] re-interpreted into a modern context of a spiral wherein time comes from somewhere and goes to somewhere in a pattern which repeats (a similar but not an exact repeat). Death and birth frame the human life, but there is life before birth and life after death. Death tells us that we, in life, are not in control and Christ tells us that death is not in control. According to the Buddha there is a unity in all things thus the motto "one and all". Thus, a simple spoon has the power to transcend generations and give us a glimpse into the private affairs of a thoughtful, productive family. Note: there are other interpretations of this phrase -- see below for reader comments. NOTE: some readers claim that I have misinterpreted the words "MeorRasdheDheu". They have made the assertion that this is old English or old Welsh. I looked at old English and old Welsh and Old Irish dictionaries on the web and I was unable to find any of these words with these or related spellings. However, I am open-minded and if someone with more expertise in this area can show me proof that my interpretation of these words is wrong, I will happily change my interpretation. 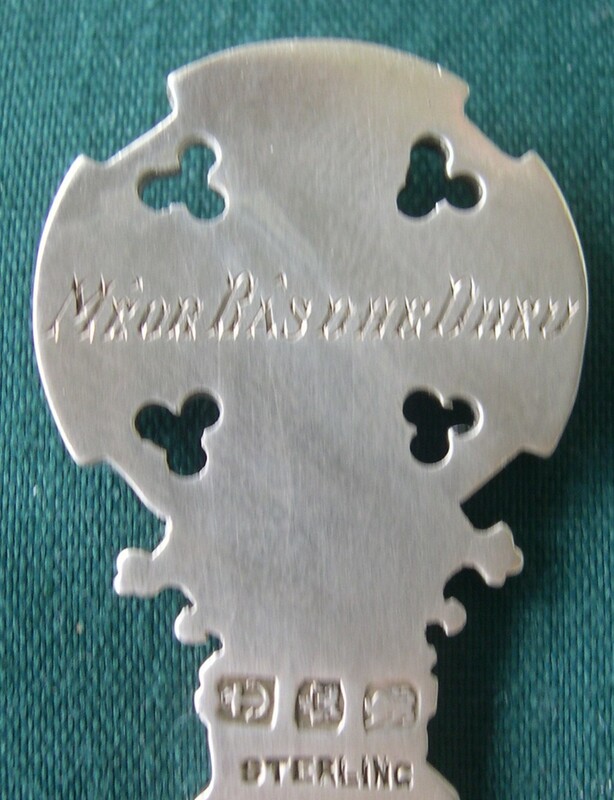 Dr. Buchtel has found a reference to this spoon in the McGill library"
"On the reverse of this cross appears the inscription “Meor Ras dhe Dheu,” which may be a variant spelling of the Cornish “meur ras dhe Dhyw” (I am thankful to God),1which is appropriate given the family’s roots in Cornwall and Mrs. Osler’s status as the wife of an Anglican minister." There isn't really any 1 place: depending on whether Irish Gaelic, Welsh Gaelic or Scots Gaelic, the key word is DHEU ( ie God),. And if one knows French for example, DIEU is God. into the Gaelic. Go back to the Mary Queen of Scots period : big movement of French & Scots who were allies & both wary of England's Queen Eliz. I. Something such as Great or Big (ie to signify a size ) could be spelt Meor, or Mur, & variations therein again. still spoken in Nova Scotia (Cape Breton),Canada, etc etc. Gaelic was much more often the spoken people's language, much discouraged to be written & printed when the English were the high ruling class, and hence all these variations. While the spellings will be different depending on who is writing, the spoken/pronounced words will be prob. pretty similar to a Welsh, Scots, or Irish person hearing. Much as a Norwegian, Dane & Swede will all know most of each other's languages altho' the words will have simple or even major spelling variations. You could spend 2 weeks w/ a linguist on this simple phrase!